Journalist Nikhil Wagle has been time and again called out on social media for his controversial postures regarding various issues. In August he was slammed on Twitter for putting up an insensitive tweet, which tried to politicise the unfortunate deaths of children in Gorakhpur’s Baba Raghav Das Medical College. Wagle later was exposed by his fellow journalist, when he tried to play the victim card after his TV show was stopped by Marathi news channel TV9. He had claimed that the channel took his show off air because of political pressure, but the truth of the matter was, that it was discontinued due to dismal TRP ratings. As per the above tweet, going by the swarm of people, Anna Hazare was getting major public support in Karnataka, ahead of his fast against the Modi government from 23rd March, to protest against the “pitiable state of Indian farmers”. This possibly insinuated, that the Modi government should feel the pressure ahead of Anna’s Ramlila Maidan fast, considering the massive public suppose Anna was generating in parts of the nation. This tweet of Wagle perhaps also aimed to put Modi Government in the sport considering the next major assembly election is to be held in the state of Karnataka. 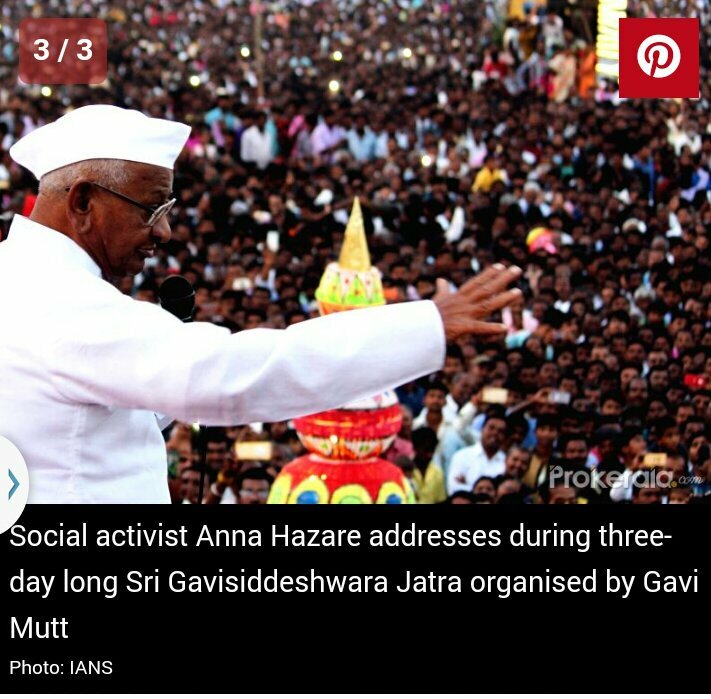 As reported, this Jatra organised annually under Sri Abhinava Gavisiddeshwar Swamiji’s stewardship, draws scores of devotees and Anna Hazare was a special attendee. After the event, Hazare remarked that, this event showcased the great cultural heritage of India. So as seen above, the crowds weren’t drawn to a Anna Hazare rally, and the picture was actually of Anna being present at the Jatra. This is the Gavisiddeshwara Jaatre at Koppal. This annual jaatre began in 1813 and has always been this massive. So large is the gathering there that it is popularly referred to as Karnatakada Kumbha Mela. This does raise the question, as to why a journalist of his ‘seniority’ decided to merely go by his ‘trust instincts’ and not do a basic fact check before putting out the tweet. Is it because some journalists consider it okay to take refuge under ‘trust’ when the issue favours their agenda and otherwise suppress ‘unfavourable’ issues under the pretext of fact-checking? Also, even though Wagle has now apologised for his tweet, he at the time of compiling this report hasn’t yet deleted it, raising the question whether he wishes the lie to continue propagating, while he continues to assume moral high ground.